We're Number One! Take the Lead We Mean Business > d i v e r s i t y w o m a n . c o m Fa l l 2 0 1 4 D I V E R S I T Y W O M A N 35 By Tamar a E. Holmes W hen it comes to diversity and inclusion, what is the true mea- sure of success? For some companies, being named to a "best of " list for diversity and inclusion is the ultimate trophy, giving chief diversity ofcers an achievement to justify their growing budgets. But true diversity and inclusion go much deeper, experts say, and using awards to gauge progress could be setting D&I eforts back. Awards, like everything else, have their place, says Melissa Lamson, founder and presi- dent of Lamson Con- sulting, a Scottsdale, Arizona–based company that provides global D&I strategy. Tey get companies thinking about diversity and what steps they are taking to build an inclusive environment. "But awards can't be the sole approach to a diversity initiative," Lamson says. 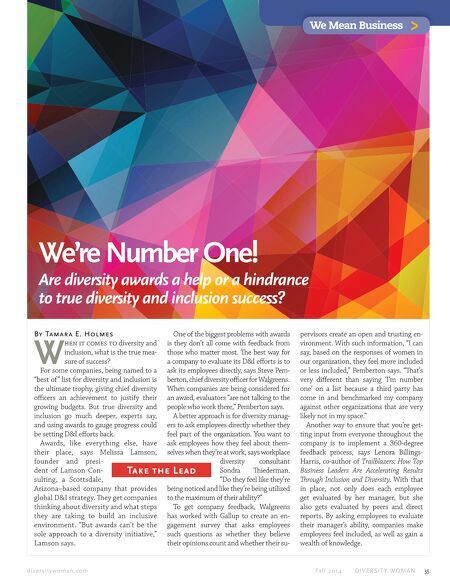 Are diversity awards a help or a hindrance to true diversity and inclusion success? One of the biggest problems with awards is they don't all come with feedback from those who matter most. Te best way for a company to evaluate its D&I eforts is to ask its employees directly, says Steve Pem- berton, chief diversity ofcer for Walgreens. When companies are being considered for an award, evaluators "are not talking to the people who work there," Pemberton says. 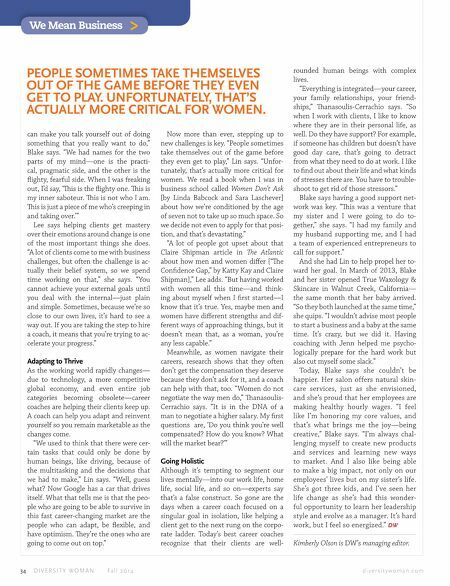 A better approach is for diversity manag- ers to ask employees directly whether they feel part of the organization. You want to ask employees how they feel about them- selves when they're at work, says workplace diversity consultant Sondra Tiederman. "Do they feel like they're being noticed and like they're being utilized to the maximum of their ability?" To get company feedback, Walgreens has worked with Gallup to create an en- gagement survey that asks employees such questions as whether they believe their opinions count and whether their su- pervisors create an open and trusting en- vironment. With such information, "I can say, based on the responses of women in our organization, they feel more included or less included," Pemberton says. "Tat's very diferent than saying 'I'm number one' on a list because a third party has come in and benchmarked my company against other organizations that are very likely not in my space." Another way to ensure that you're get- ting input from everyone throughout the company is to implement a 360-degree feedback process, says Lenora Billings- Harris, co-author of Trailblazers: How Top Business Leaders Are Accelerating Results Trough Inclusion and Diversity. With that in place, not only does each employee get evaluated by her manager, but she also gets evaluated by peers and direct reports. By asking employees to evaluate their manager's ability, companies make employees feel included, as well as gain a wealth of knowledge.